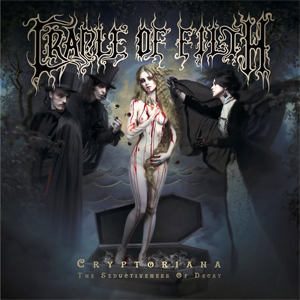 UK's legendary extreme metal icons CRADLE OF FILTH have released the second single off of their 12th album, Cryptoriana - The Seductiveness Of Decay. Watch the official lyric video for "You Will Know The Lion By His Claw" below. I also have the latin of this expression tattooed on my arm (due to being the usual supercilious Leo!). The quote was made famous having been said in 1697 by Johann Bernoulli about Isaac Newton's anonymously submitted solution to Bernoulli's challenge regarding the Brachistochrone curve. So… Enjoy. Indulge. Desire. Darken." The album is now available for pre-orders. Cryptoriana - The Seductiveness Of Decay will be released on September 22 via Nuclear Blast. The album will be available in various formats/editions. Also find the stunning cover artwork by Arturs Berzinš. Berzinš is the mastermind behind the new record’s artwork, photography and videography – best known for his defiant neo-symbolism raster graphics and oil paintings; postmodern interpretations of classic myths. He has been proclaimed as a “sacred monster of Latvian postmodernism”.